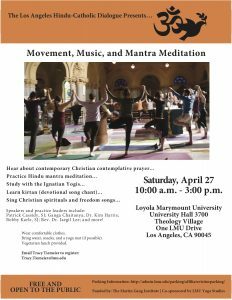 The Los Angeles Hindu-Catholic Dialogue, with which the Vedanta Society is affiliated, presents a program of Movement, Music, and Mantra Meditation on Saturday, April 27 from 10:00 am to 3:00 pm at Loyola Marymount University. There will be time to attend and to also be present at our Annual Members Meeting at 4:00 pm in Hollywood. Hear about contemporary Christian contemplative prayer. Practice Hindu mantra meditation with our Assistant Minister Swami Satyamayananda. Study with the Ignatian Yogis. Learn kirtan (devotional song chant). Sing Christian spirituals and freedom songs. Speakers and practice leaders include Patrick Cassidy, SJ; Ganga Chaitanya; Dr. Kim Harris; Bobby Karle, SJ; Rev. Dr. Jaegil Lee; and more. Wear comfortable clothes. Bring water, snacks, and a yoga mat (if possible). Vegetarian lunch provided.